The extension requires no configuration. Guest to Customer is a Magento 2 extension that helps you convert guests (customers who bought from you but didn't create an account) to registered customers. The extensions requires no configuration - once you install it it is ready to be used. Disclaimer: it is a good security measure to backup your files and DB before you use the extension. Just in case things go wrong you would have all your data intact in a safe place. How to see a list of all guests? Website Name - a website name a guest placed an order on. In case you run multi-site magento installation a guest could belong to various websites. How to convert a particular guest to a registered customer? 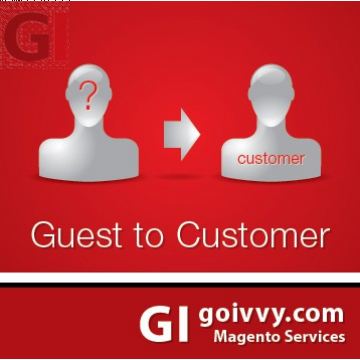 If you want to convert a particular guest to a registered customer first go to Customers > Guest 2 Customer in magento backend. How to mass convert all guests? The extension lets you mass convert all guests to registered customers.